If Rotherham needed reminding just how tough life in the Championship is going to be for them, then a look at the fixture list over the next couple of weeks should do the trick. 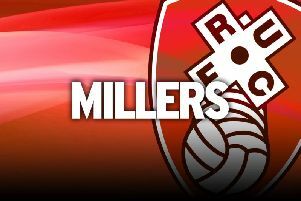 The Millers have made a respectable start to life back in the second tier having taken six points from their opening six games but boss Paul Warne might be having sleepless nights about their next four games. They resume after the international break against Frank Lampard's Derby, followed three days later by a trip to Aston Villa. They are back on the road to visit Nottingham Forest – a ground they rarely get anything from – before September ends with a televised visit of Stoke. But Richie Towell believes that a schedule like that makes all their hard work in getting promoted last season worthwhile. And the Irishman, who will be hoping for a first start of his second Millers stint against the Rams, reckons his side can cause a few upsets. “I don't think there are any easy games in the Championship but I think the next four that we have are the toughest four you could pick,” he exclusively told the Star. “It is not going to be easy for us but that is why we were so excited to get promoted to the Championship. “These are the games you want to be playing, you want to go to the likes of Villa Park, a historic stadium, you want to go there and test yourselves against the best so it is something we are looking forward to and hopefully we can get some results. “We want to get some points on the board and achieve something great this season. Warne, who enjoyed a short family break to Whitby during the international hiatus, has also spent time studying where the Millers have gone wrong so far this season. And he wants to turn those failings into positives ahead of his side's tough run. He said: “Even though we have lost a few, we have always tried to learn from it.